At the first public meeting in November 2011 four possible sites for the new station were presented: The current site at 320 Central Avenue, State Street on the existing Kodak parking lot site, Andrews Street on the west side of the river, and the old post office on Cumberland. 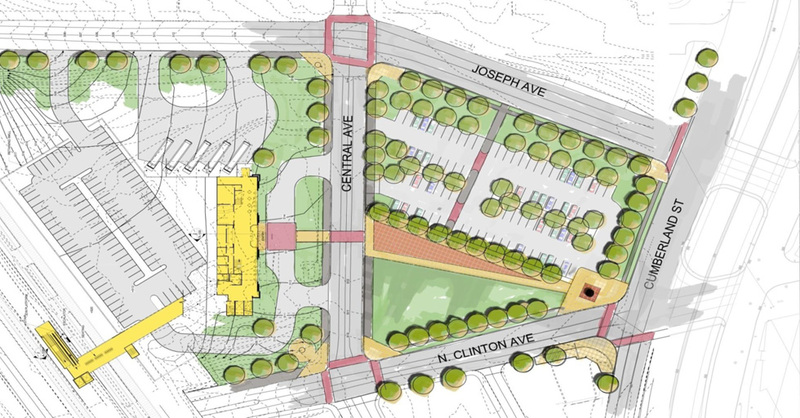 78% of those who commented preferred the current site at 320 Central Avenue (site #1) over the other three options. Planners like this site as well because the tracks are already configured appropriately in this location and the site has a straight line of site to Rochester’s downtown core. This site was also where Rochester’s beloved Claude Bragdon station once stood. This was also the site chosen by Reconnect Rochester for our concept plan. 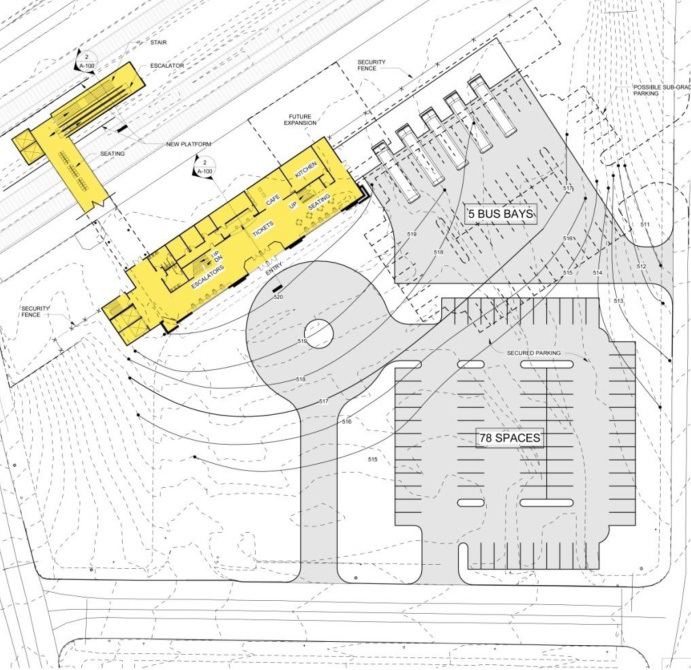 One option places the building up against the tracks with a parking lot situated between the building and the street. While this option aligns with tracks it does not reinforce the urban fabric of the neighborhood because it is situated behind a large surface parking lot—not pedestrian friendly and a bit ugly too. 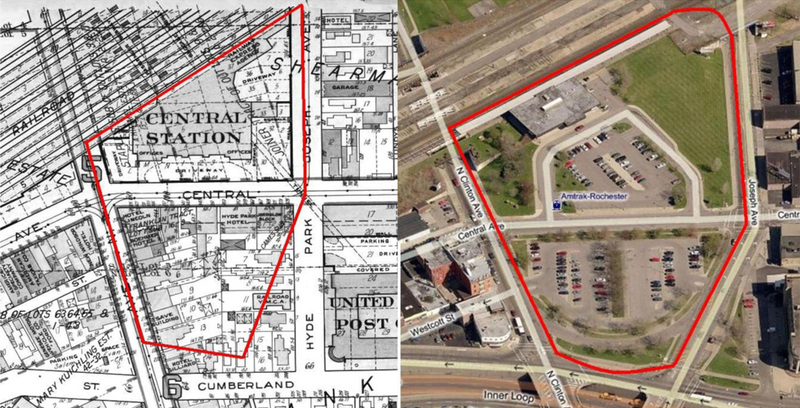 This option is closer to the original site orientation of Bragdon’s Union Station. With the building closer to Central Avenue this plan reinforces the urban fabric and provides more opportunity for lease space (shops, a café, etc.). In addition, the parking lot could be tucked behind the building—hidden from the street. 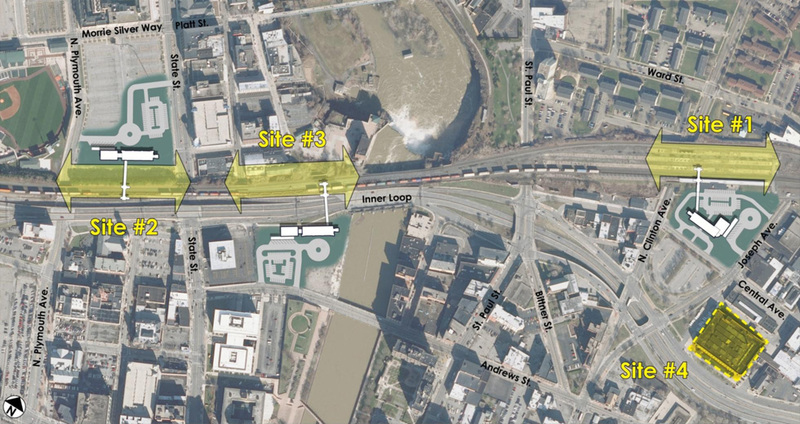 It’s also important to note that both of these site design alternatives call for an elevated pedestrian bridge to connect the station to the train platforms. In our concept plan Reconnect Rochester called for the existing Bragdon/Union Station tunnels to be renovated and reused. Because the platforms sit one level above the station ground floor, any elevated pedestrian bridge would need to be roughly 3 to 4-stories high—it would need to pass over the tracks/platforms and provide enough clearance below for passing trains. This means passengers would need to take stairs/elevators up to the bridge, and then back down to the platforms. Why not just use the tunnels that are already there beneath the platforms? It would mean a much easier trek to the trains! Oh, and the train platforms should also be covered with a canopy, please and thank you. In this option vehicles would enter and exit the overflow parking lot from Central Avenue. Not ideal since most pedestrian activity will be on Central Avenue. In this option vehicles would enter and exit the overflow parking lot on the Joseph Avenue side. 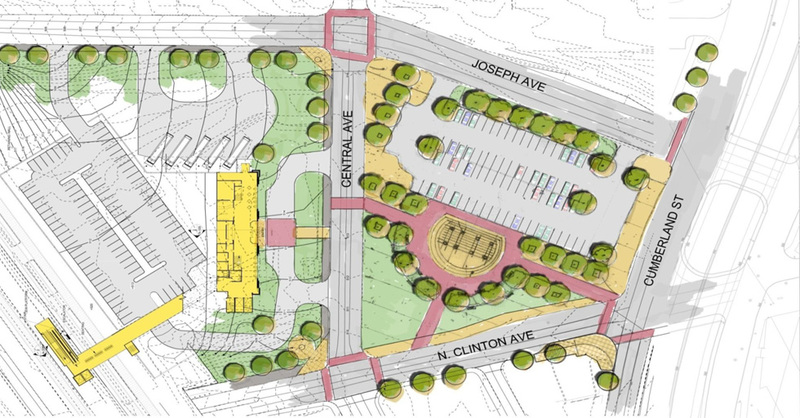 Although we would have preferred to keep all of the parking area on the north side of Central Avenue, this is option is preferred over the previous one. and bring your comments and suggestions with you! As a frequent AMTRAK rider… The current location is just fine… the facility however is a different story… The Rochester facility is deplorable, dirty, poorly lit, not at all well managed. Compared to other similar sized cities with AMTRAK service, both on the east coast, west and central states, our facility is BAD. Now that there is real interest in developing a true intermodal facility, let’s get it right. Please no elevated walkways, stairs or other restrictions to the handicapped that use the rail system… We know that it sounds good but on the cold night while disembarking from the train and the elevator/escalator doesn’t function what then? We’ll try to attend the meeting… and thanks to Reconnect Rochester for compiling this information! what happen to the previous plans you had posted back in May 2011?! These plans are fair…but last years renditions were EXCITING! It had character! This plan looks BORING! @Al, are you referring to this design concept with the clock tower we drew up last year? We presented it to the City and their professional design team. They basically told us it would be too expensive. But you should definitely send them your thoughts. We thought our design concept was pretty exciting too! Thank you! I, too, am disappointed with this scaled-down version; the one designed last year celebrated Rochester’s history, and it had the ability to inspire. On the other hand, the design being proposed now is not that bad and has a lot of potential. For example, the second option of tucking the parking between the station and the tracks may take a slight alteration of design at no extra cost, but it will pay great dividends in connecting the station visually and physically to the rest of downtown, especially if the old inner loop is reworked into a boulevard. We should keep in mind that this station will serve as front door for those approaching from two opposite directions. For those entering the facility from the street, it should be a doorway to travel and imagination. For those detraining after a trip, what might be considered the back of the station is actually the front door to the city and the region. It should be a visually appealing and welcoming threshold to a city we love and want others to love as well. In addition, those through-passengers staying on the train will be looking at the place from their seats, and that view may be their only experience of Rochester. When the train pulls out, we want them to take a pleasant thought with them; it is good advertising for the region. The parking lot, therefore, should have good elements of design such as berms with low vegetation and environmentally friendly lighting. In addition, the bus bays should have roofed platforms that match the ones the train platforms will have. These may seem like small things, but they make a big impression. In the interest of saving money, maintaining good design and upkeep, not to mention taking into account the vagaries of Rochester weather, the Bragdon tunnels should connect the station to the tracks, not an overhead bridge. If possible, the tunnel stairways should be converted to ramps for the ease of those in wheelchairs and using roller luggage. We will then be able to include free luggage carts, as they do in Europe. I was not able to attend the meeting on 30 May. How did it turn out? Really nice looking design. A nicer train station would be a great thing to have. The overhead bridge idea is loopy. As you note, there’s already a tunnel underneath the tracks. (Two, actually.) The passenger tunnel should be rehabilitated and reconnected to the tracks. Going up three stories and then down two stories (and make no mistake, the bridge will need clearance for very tall freight trains) is just wrong. 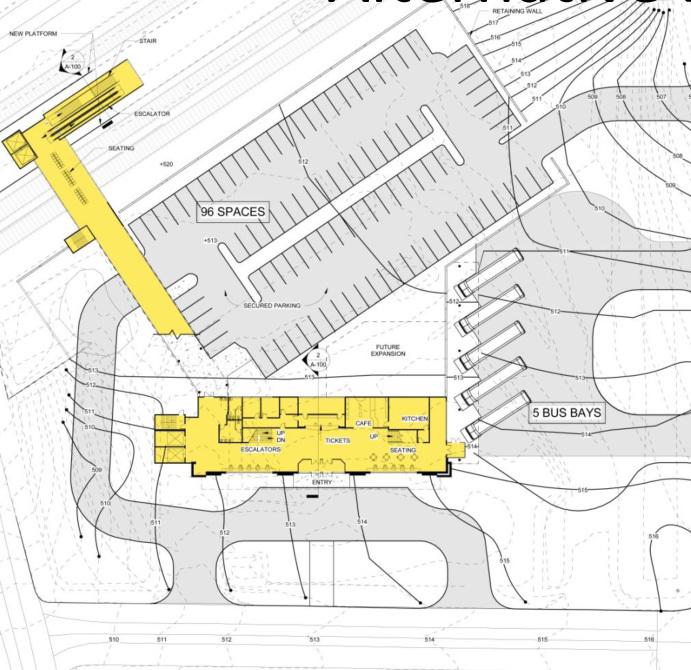 Although this may require some redesign of the parking lot layout to connect the tunnel properly to the new building — the tunnel being on “ground level” — it really would be *so* much wiser. As a note, the Los Angeles Union Station tunnel design is a decent model; the Syracuse station platform access is also similar. Just as an aside for whomever might be interested, NJ Transit, New Jersey’s statewide public transit provider recently completed a tremendous overhaul of the station located in Somerville, NJ. Unique to this station is the fact that it has a pedestrian tunnel connecting the tracks rather than an elevated walkway. This is an example of a revamp of a passenger tunnel that I feel gets tunnel design right as it is well lit, handicap accessible, and capacious in width. If Rochester were to look somewhere for a good example to remodel its own passenger tunnels I would recommend looking no further than Somerville, NJ. @Christopher, Great reco. Thank you. And here are some photos of the Somerville tunnel and platforms. You know…this issue of which design is the most inexpensive is ridiculous! I’m not saying the cost should be EXTRAVAGANT…however…we are only going to build this ONCE for the next, say what, 100 years! Your plans from 2011 are, by far, the nicest plans…OUT THERE! Do some tweeks, that’s fine! But WHY should Rochester ALWAYS get second-grade consideration?! They didn’t think twice about spending over $1 Billion to build the new Yankee Stadium in NYC! Governor Cuomo didn’t flinch when he sent Buffalo $1 Billion earlier this year! We’re part of New York State and this is a PUBLIC PROJECT that will benefit this community! Unbelievable! There really needs to be an outcry about this! Oh…let’s not forget Governor Cuomo’s newest pet project…$5 BILLION for a NEW Tappan Zee Bridge! Last time I drove over the Tappan Zee…it looked pretty good to me! You can build an ENTIRELY NEW INTERNATIONAL AIRPORT for $5 BILLION! And we’re SQUABBLING over a DECENT rail station for Rochester?! I guess we don’t live CLOSE enough to New York City for those LUXURIES! Hello, I am senior in Alfred State’s Architecture bachelor’s program, and I’m actually doing this station for my thesis. I was wondering if I could see how you are designing the station and if you would want to see some of my design ideas or thoughts? Also its hard to tell, but are the existing tracks being used and the trains themselves are just being updated or the tracks themselves being raised slightly? I’ve been having trouble looking up the platform design dimensions.